Viz Raider: Which MLB Teams Have the Most Luck? 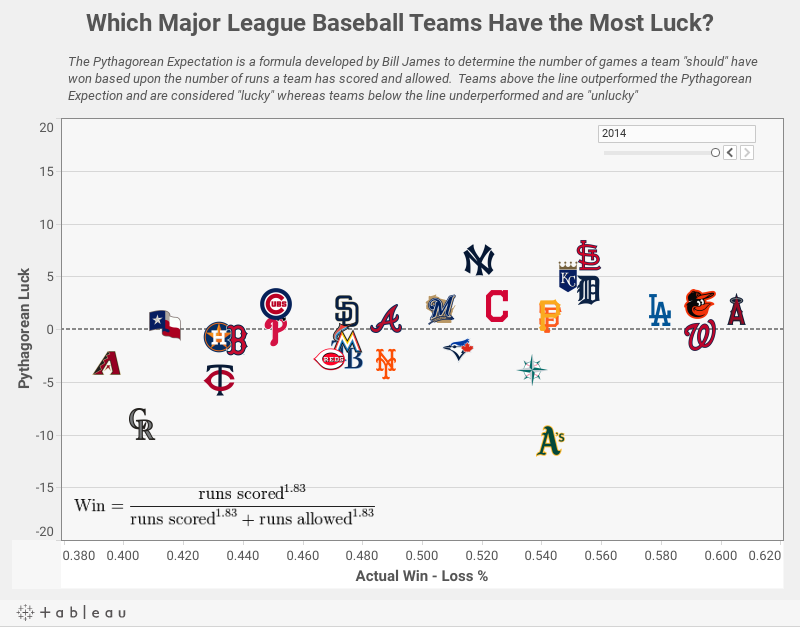 Which MLB Teams Have the Most Luck? The Pythagorean Expectation was developed in the 1980s by legendary baseball statistician Bill James. The formula is used to determine the number of games a team "should" have won based upon the number of runs scored and allowed. He originally used an exponent of 2, which has been revised over the years to the current 1.83. Teams who outperform their Pythagorean expectation are generally perceived as "lucky" and those who under perform are considered "unlucky." This viz allows you to take a look at which teams are lucky or unlucky over the years.